Hi, it’s David again looking at another video slot game. This time I’ve been looking at Spinata Grande. This game has a chirpy Mexican party theme – Spinata, get it? It makes us want to have a fiesta! There’s plenty of celebration going on as the graphics show like pinatas, multi-coloured balloons, confetti explosions, various different party decorations and, of course, lots of happy Mexicans going about their cheerful business. The sound effects and music are pretty good – who doesn’t like a Mariachi band?! 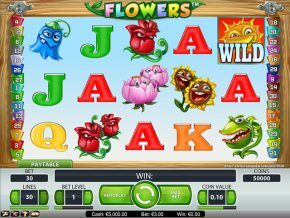 Money-wise, this one’s a good game for everyone’s wallet as it has a coin value of anything from €0.01 up to €1.00, and it will accept a maximum bet of €200 each time you hit the spin button for all you high rollers out there. On the surface, Spinata Grande is a very simple slot – there’s no second-screen bonus game, no progressive jackpots and the payouts are fixed and, if I’m honest, a little bit on the small side. However, don’t judge a book by its cover as there’s a surprise in store – Spinata Grande has play symbols that can turn into monster 2×2 or even 3×3 symbols, something I haven’t seen on any of the other games from the same stable. There’s also a special bonus symbol that actually turns into a mini slot machine where you can win free spins and some additional coins. 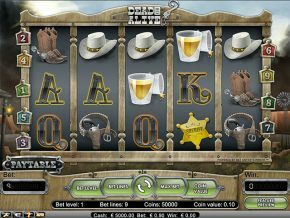 So despite its uncomplicated appearance, you can actually win up to 240,000 coins playing this slot machine – arriba, arriba! For the technically-minded amongst you I can tell you that the Spinata Grande game is a five reeler with 40 paylines. 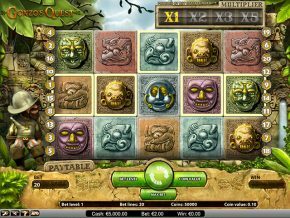 You can bet anything up to 10 coins for each playline from €0.01 to €1.00. There’s a minimum bet of €0.20 which makes it great for beginners or casual players, but if you’re a big shot looking for some fiesta fun then you’ll be happy with the maximum stake of €200. Don’t be misled by the highest fixed jackpot being only 300 coins either because those excellent super-size symbols and the mini slot all combine to mean you can actually coin it in up to 240,000 – ay caramba! To keep you on your toes even more there are tons of special symbols like Free Spin, Extra Spin and some actual bonus coins that you can find in the mini slot game. I’ve also found a cheeky Bonus symbol which can appear as one of the giant symbols and then unlocks the mini slot for you. So there’s more to this one than I first thought. It’s got to be said, the fixed payouts for Spinata Grande are pretty meagre. For example if you manage to line up 5 bulls (Olé!) on a line you score the top payout… of only 300 coins. Combinations of 5 of the dogs or the parrots will only net you 200 or 100 coins each. 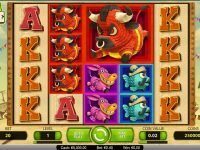 Not much of a Fiesta happening there – but don’t forget the giant symbols and mini slot game can lead to significant winnings, so this game is one that’s worth sticking with fora while. As I’ve already mentioned, the main game of Spinata Grande features the potential for the giant symbols to appear, although it’s worth noting that during the free games it’s only the wild card Star that can turn into a “grande”. If you manage to get one of these oversize bonus symbols on your reels then it transforms into a mini slot with anything up to 9 symbols for the biggest 3×3 giant symbols. If you’re lucky enough for this to happen in the full game you’ll find the mini slot machine contains coins, free spins and extra spins – but during the free spins rounds then all you’ll get will be extra spins and bronze coin symbols. If you’re one of the lucky ones and manage to get 3 free spin symbols in your mini slot then your Mexican pinata fiesta will be extended by getting 5 free games. If you’re totally rocking it and get more than 3 you’ll get an additional free spin for each extra. Phew, that’s a lot of free spinning, amigos! Although there are some quirks like the giant bonus symbols and so on, Spinata Grande is played in exactly the same way as all the others. All you need to do is choose the number of paylines you’re going for, how many coins you want to bet per line and the value of those coins. Selections are made with the Coin Value and the Level buttons on the screen, so click away. There are some handy shortcuts, too – if you want to go for it and place the maximum allowed bet there’s an appropriately labelled “Bet Max” button just for you. After that it’s just a case of hitting the good old-fashioned “Spin” button to get this Mexican party started. If your spin results in a winning combination you’ll get an immediate automatic payout, otherwise it’s time to place your bets and try and hit the pinatas again. If you’re feeling a little lazy (maybe you’re all partied out from the fiesta fun?) you can use the “Autoplay” button to set the reels spinning automatically for you chosen number of spins. So are you ready for Spinata Grande? Vámonos!